LA JOLLA–Scientists at the Salk Institute have discovered a powerful one-two punch for countering a common genetic mutation that often leads to drug-resistant cancers. The dual-drug therapy–with analogs already in use for other diseases–doubled the survival rate of mice with lung cancer and halted cancer in pancreatic cells. Lung cancer, which affects nonsmokers as well as smokers, is the most common cancer worldwide, causing 1.6 million deaths a year, far more than pancreatic, breast and colon cancer combined. About 30 percent of the most common type of lung cancer (non-small) contains a mutation in a gene called KRAS. This mutation can also lead to hard-to-treat cancer in the pancreas, thyroid and colon. The new discovery, detailed November 19 in Science Translational Medicine, shows how the two-pronged attack successfully hindered KRAS and other cellular processes to halt or shrink tumor growth. When activated, mutated KRAS clings to cell membranes and recruits proteins to ramp up cancer growth. Researchers have developed drugs to disable enzymes that tether KRAS to the cell membrane, but these drugs typically ended up being toxic because those enzymes are needed in the body for normal functions. “The Achilles’ heel of KRAS is its movement to the membrane,” says Verma, who is also holder of Salk’s Irwin and Joan Jacobs Chair in Exemplary Life Science. The researchers took a new approach to targeting this membrane interaction when they noticed that a drug called Zometa, typically used to stop the breakdown and growth of cells in bone disease, also interfered with cell membrane interactions. In previous work, the team added carbon chains to a molecule similar to Zometa, to create a lipophilic bisphosphonate (BP) that blocked KRAS from attaching to the cell membrane. “For the first time, we had the ability to interfere with KRAS without being completely toxic,” says Verma. This, however, wasn’t enough. Tumors were still proliferating, in part because the new BP led to failed attempts of a process called autophagy, where cells, under stress, self-destruct and break down into nutrients that can be used by other cells. Autophagy can be both good and bad in fighting cancer: in some cases, autophagy prompts cancer cells to die; in other settings, it creates a cellular environment that helps tumors thrive. With the BP treatment, cells began the process of autophagy but failed, leading to junk protein accumulation and an inflamed environment that helped the tumors to survive. But, as demonstrated in the new work, when the researchers added a chemical called rapamycin, cells were able to carry out autophagy successfully and prevented tumor cells from proliferating. Rapamycin, discovered in the 1970s, is used in the clinic for preventing organ rejection and has also been linked to anti-cancer effects. Mutation of the KRAS gene leads to a common and hard-to-treat lung cancer. A new combination therapy (lipophilic bisphosphonate and rapamycin) administered to mice for 40 days resulted in shrunken tumor size (right). 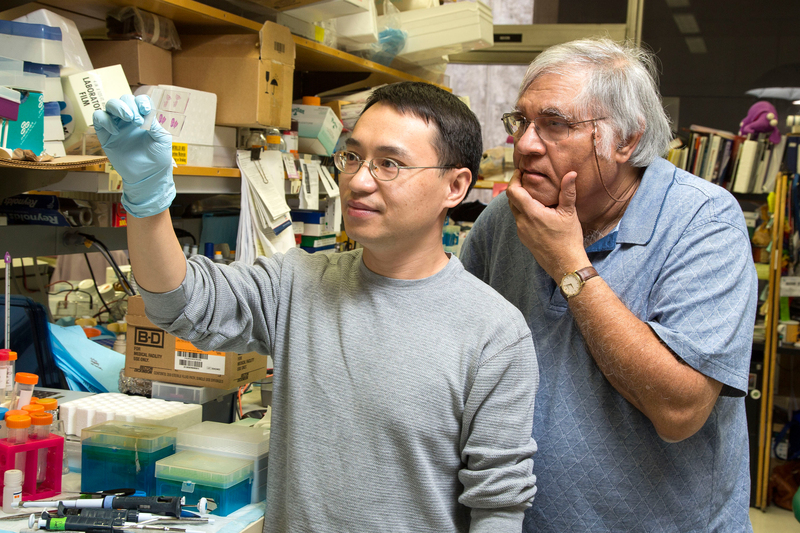 “We found if we also activated autophagy–with the rapamycin–and combine it with the inhibitor of the cell membrane–the BP–there were significant cell deaths in the tumors,” says Yifeng Xia, Salk researcher and first author of the new work. When they injected the combination in mouse lung tumors, tumors shrunk or stopped growing. 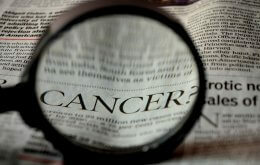 The study also found that a pancreatic cancer cell line responded to the dual treatment. Next, the team plans to test toxicity of the new BP. The group is also working with the University of California, San Diego, Moores Cancer Center to design human clinical trials to test the dual therapy. In addition to Verma and Xia, authors on the paper included Shen Shen, Narayana Yeddula, Wolfgang Fischer and William Low of the Salk Institute; Yi-Liang Liu, Wei Zhu, Francisco Guerra and Eric Oldfield of the University of Illinois at Urbana-Champaign; and Yonghua Xie, Xiaoying Zhou and Yonghui Zhang of the Tsinghua University. The work was funded by the National Institutes of Health, Ipsen Biomeasure, the H.N. and Frances C. Berger Foundation and the Leona M. and Harry B. Helmsley Charitable Trust.